Pearson's MyLab & Mastering products exist for each title, including customized versions for individual schools, and registrations are not transferable. In addition, you may need a CourseID, provided by your instructor, to register for and use Pearson's MyLab & Mastering products. Packages Access codes for Pearson's MyLab & Mastering products may not be included when purchasing or renting from companies other than Pearson; check with the seller before completing your purchase. Used or rental books If you rent or purchase a used book with an access code, the access code may have been redeemed previously and you may have to purchase a new access code. Access codes Access codes that are purchased from sellers other than Pearson carry a higher risk of being either the wrong ISBN or a previously redeemed code. Check with the seller prior to purchase. 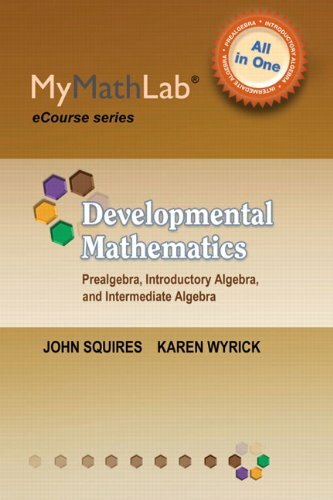 --John Squires and Karen Wyrick have drawn upon their successes in the classroom and the lab as inspiration for MyMathLab for Developmental Math: Prealgebra, Introductory Algebra & Intermediate Algebra . This new MyMathLab® eCourse offers students a guided learning path through content that has been organized into small, manageable mini-modules. This course structure includes pre-made tutorials and assessments for every topic in the course, giving instructors an eCourse that can be easily set up and customized for a variety of learning environments. 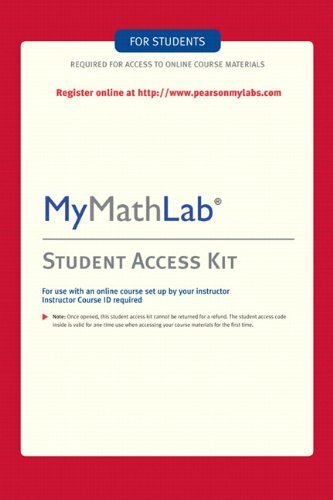 This package consists of the MyMathLab access kit only, and does not include any supplementary material.